Note: This 3SE3 series is now obsolete and availability is limited to quantities on hand. The new 3SE2 series that replaces it has a different conduit size which will cause fit problems. The 3SE3's had the old metric PG13,5 threads and the new 3SE2's have the new metric M20 threads. The replacement contact blocks and operating heads are shown at the bottom of this page. We stock these repair parts for immediate shipment. The best thing to do is simply replace the operating head and contact block, saving only the old aluminum housing. If the housing has been damaged, you may select the equivalent new 3SE2 version and use the VPG13,5/M20 conduit adapter shown at the bottom of that page. 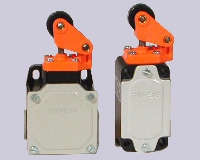 "3120" units are narrow body with 1 conduit opening.